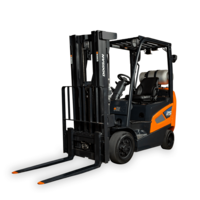 Atlanta, Feb. 27, 2019 /PRNewswire/ -- Doosan Industrial Vehicle America is pleased to announce the launch of the all-new 9-Series Internal Combustion Cushion Tire Forklift line. With improved maneuverability, a high visibility mast, and heavy-duty cooling systems, Doosan has again delivered what dealers want and what customers need. Ranging from 3,000 lb. to 12,000 lb. capacity, these lift trucks were made specifically for the warehousing, paper, bottling, and trucking industries. "We are thrilled to expand our product line in the North American market. Not only will this be a great addition to our current offerings, but it will also solidify the partnership we share with our dealers. It's another example of our commitment to North America, to our dealers and to our customers," Tony Jones, CEO remarked. Doosan is Korea's oldest business organization with a proud history of 122 years. As the world's leading Infrastructure Support Business (ISB) provider, Doosan delivers the basics necessary for improving the quality of people's lives. Doosan's history represents a story of dynamic change and growth. Founded in 1896 as Korea's first modern retail business (known then as Park Seung-jik Store), Doosan has established itself as a world-class ISB provider. With about 40,000 employees in 38 countries, Doosan now operates 25 affiliates and 121 global entities. Doosan is present in every area of the infrastructure support business, which encompasses energy development, industrial facilities, parts and machinery, heavy equipment, construction, civil engineering, transportation, and other value-added areas. Turret Truck enables narrow aisle loading and retrieval. Electric Forklift Truck features 180-degree rotating cabin. Diesel Forklift is designed for fuel efficiency, low emissions.